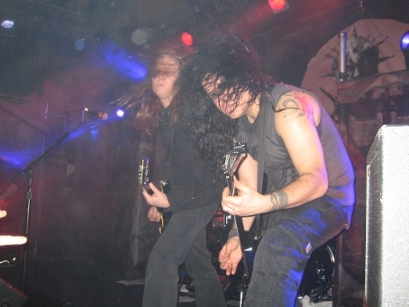 On Sunday, March 21, 2010, Kreator performed at Slim’s, a 400 seat club in San Francisco. In contrast to my other reviews that contained off the cuff lighthearted commentary, I found it inappropriate for this review. Kreator is a no frills thrash band that gets on stage and decimates everyone and everything in its path, making it asinine for me to venture in that realm, somewhat like belching at the loudest decibel while eating at a fancy French restaurant. Kreator played 17 songs during an 85 minute set from 10:45 to 12:10. 1. Choir of the Damned (Intro.) (Pleasure to Kill record, 1986) is an instrumental song that clocks in at one minute and 40 seconds. This song, which features atmospheric keyboards and acoustic guitars, served as a good introduction because it has an ominous tone. 2. The Pestilence (Pleasure to Kill, 1986) is a frenetic thrash song. 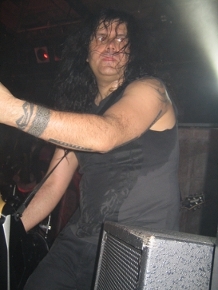 Midway into the song, Miland “Mille” Petrozza (vocalist/guitarist, “MP”) commanded the crowd, “San Francisco, mosh pit!” MP wore an off black muscle shirt with a spiral cloud image on his chest and black cargo cotton slacks. MP then went stage right by Christian “Speesy” Giesler (bassist, “CG”). MP and CG began banging their heads in unison, prompting many of the audience members to follow suit. 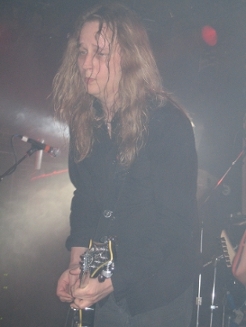 Jürgen “Ventor” Reil’s (“JR’s”) loud double bass drumming was in the forefront and served as a pummeling force leading the song straight through the gates of hell. The guitar riffs at the 3:30 mark paid homage to Slayer’s Crionics off the Show No Mercy record (1983). 3. Hordes of Chaos (A Necrologue for the Elite) (Hordes of Chaos, 2009). Before Hordes of Chaos (A Necrologue for the Elite), MP said, “Good evening San Francisco.” Hordes of Chaos (A Necrologue for the Elite) is mid tempo for approximately 50 seconds and then shifts to a fast tempo. The song features a catchy chorus during which many of the audience members stage front in the near sold out club bobbed their heads. When MP shouted “Chaos!” the frenzy in the mosh pit further escalated. At approximately the 3:00 mark the song reverted back to mid tempo after which it resumed its fast pace. As MP chanted the chorus line, “Everyone against everyone!” he raised both his fists in the air while CG kneeled his head forward and rolled it in a clockwise fashion a la George “Corpsegrinder” Fisher (Cannibal Corpse vocalist). 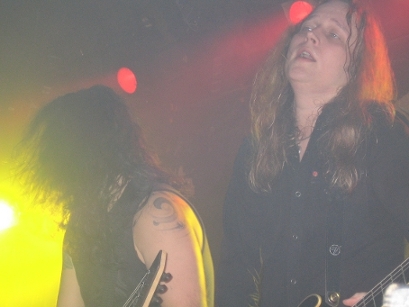 CG wore black jean pants and a short sleeve button down black shirt with a “Kreator” red logo and demon character on the back and a “Kreator” red logo on the left chest. CG played a black Mensinger flying V bass. At the end of the song MP raised his black flying V Jackson guitar with a white trim. 4. Phobia (Outcast, 1997) features a slightly slower tempo than Hordes of Chaos (A Necrologue for the Elite). MP sang the chorus in an ominous tone, drawing out the final vowel in the word, “Phobiaaaaa!” Following Sami Yli-Sirniö’s (“SY’s”) guitar solo, MP chanted, “Is there someone following you?” which the audience chanted back. SY wore a long sleeve black cotton shirt, black jean pants, and black combat boots. SY played a black Schecter guitar diamond series with a light tan trim. 6. 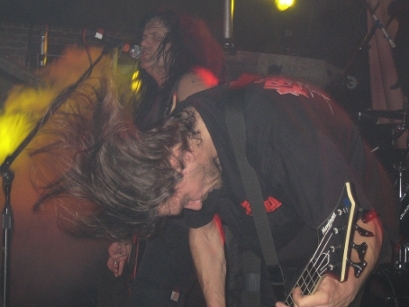 Impossible Brutality (Enemy of God, 2005). During the first verse, MP spouted, “All I see is terror. All I see is pain. All I see is mothers dragging children to their graves.” At approximately the 1:50 mark CG’s bass lines came to the forefront driving the song to, where else, the grave. 7. Endless Pain (Endless Pain, 1985). Before Endless Pain MP said, “Thank you very much San Francisco. This is the 25 year anniversary for Kreator. I guess we are f**kin’ dinosaurs. So let’s play something old school.” MP dedicated Endless Pain to a girl in the audience whom, MP said, “Gary Holt (Exodus guitarist) thinks is beautiful.” Endless Pain is a very fast tempo song off Kreator’s first record. Halfway into the song, MP commanded the crowd, “San Francisco, mosh pit!” The crowd responded with a pit filled with what appeared to be whirling dervishes. 8. Pleasure to Kill (Pleasure to Kill, 1986). Before “Pleasure to Kill” MP asked the audience, “San Francisco are you ready to kill? !” At approximately the 1:30 mark SY played a searing guitar solo during which MP, CG, and SY all stood stage right amidst red stage lights that created an apropos evil atmosphere. From approximately the 2:00 to 3:10 marks the song slowed to an ominous mid tempo. 9. Terrible Certainty (Terrible Certainty, 1987). Before Terrible Certainty MP said, “I want to see this place turn into one large mosh pit from left to right and from front to back.” This song features a catchy bass line. 10. Extreme Aggression (Extreme Aggression, 1989). Before Extreme Aggression MP said, “San Francisco I want to hear you, kill everyone!” Extreme Aggression features a wicked mid tempo riff at the outset. At approximately the 0:30 mark the song shifts to a frenetic tempo. 11. Coma of Souls (Coma of Souls, 1990). Before Coma of Souls MP said, “For this next song I want to see this place turn into the biggest f**kin’ mosh pit you have ever seen!” As its predecessor, Coma of Souls features a catchy riff at the outset reminiscent of early Slayer. 12. Amok Run (Hordes of Chaos, 2009) is a ballad that began with a light SY guitar melody. At approximately the 0:55 mark, CG and JR joined in to add power and aggression to MP’s brooding vocals. At approximately the 1:25 mark SY’s guitar licks became progressively quicker, and with an Iron Maidenesque quality, transformed the song to a pure fast tempo thrash song. MP eventually chanted the chorus, “Run amok run” as if he was passionately trying to motivate his troops to march into a blood soaked battlefield. 13. The Patriarch (Violent Revolution, 2001) is a 52 second instrumental featuring a soulful mid tempo guitar melody that led straight into Violent Revolution. 14. Violent Revolution (Violent Revolution, 2001) features a chugging riff that drives the song with conviction. The song features a catchy chorus. 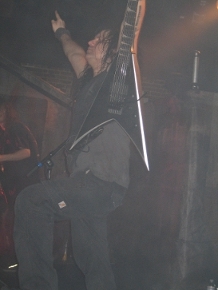 After the guitar solo MP urged the crowd to chant “Hay!” At the end of the song MP rested his Jackson flying V on his extended arm and pointed the headstock at the audience as he moved from left to right aiming the headstock at the crowd. 15. Demon Prince (Hordes of Chaos, 2009). Before Demon Prince MP said, “Okay San Francisco I want to see one more mosh pit for this final song.” Demon Prince features brilliant dual MP and SY guitar melodies at the outset. At approximately the 0:45 mark the song shifts to a fast tempo. From approximately the 2:50 to 3:40 marks the song shifts to mid tempo before resuming the frenetic pace before SY’s guitar solo. The band left the stage at 11:56 and returned in less than one minute to play three additional songs. 17. Flag of Hate (Endless Pain, 1985). Before Flag of Hate MP gave his farewell and longest speech lasting approximately 90 seconds. MP said, “Thank you very much San Francisco. Thank you for coming on a Sunday night. I am not just saying this when I say San Francisco has always been one of Kreator’s favorite places to play. Let’s play something old school.” MP then raised both hands in front of him and with his finger’s slightly bent as if clenching a football, he shouted, “It’s time to raise . . .” The audience shouted back, “. . . the flag of hate.” While still holding his arms outward, MP said, “I know you can do better than that. This is not the middle of nowhere. This is San Francisco. This is the home of Exodus. This is the home of D.R.I. This is the home of at least 10 other bands. It’s time to raise . . .” The audience shouted back at a higher decibel, “. . . the flag of hate.” MP then shouted a third time, “It’s time to raise . . .” The audience shouted back, “. . . the flag of hate.” The band performed Flag of Hate, a blistering song that literally sheered the skin off my face. At the end of Flag of Hate MP shouted, “Tormentor!” signaling the shift straight into the final song, Tormentor. 18. Tormentor (Endless Pain, 1985) is another brutal song featuring frenetic double bass drums by JR and a chugging guitar riff. At the finale of the song, the band made prominent use of the white strobe lights positioned on the stage floor by the monitors. Opening Bands (first to last): Lightning Swords of Death, Evile, Kataklysm. 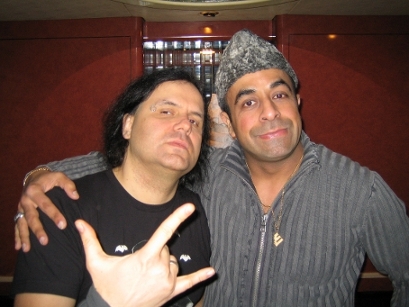 This entry was posted in Concert Reviews and tagged Kreator. Bookmark the permalink.